Driving over a mile-long bridge that spans cerulean blue water—snorkeling with a multitude of color fish—tasting that first delicate bite of key lime pie—are these the scenes that come to mind when you think of a boomer road trip in the Florida Keys? Those were certainly the images that crowded my mind. And then the folks at Florida Keys & Key West introduced me to kayaking Big Pine Key. Kayaking in Florida’s mangroves is a surreal experience. Thousands of islands extend from Florida’s tip beckoning beginner and expert kayakers alike. The water that surrounds these islands is part of the Florida Keys National Marine Sanctuary, protecting not only the watershed, but also the coral reefs, mangrove islands and seagrass meadows that weave a complex web of life- sustaining interdependency in the keys. You don’t have to be an expert kayaker to explore here. 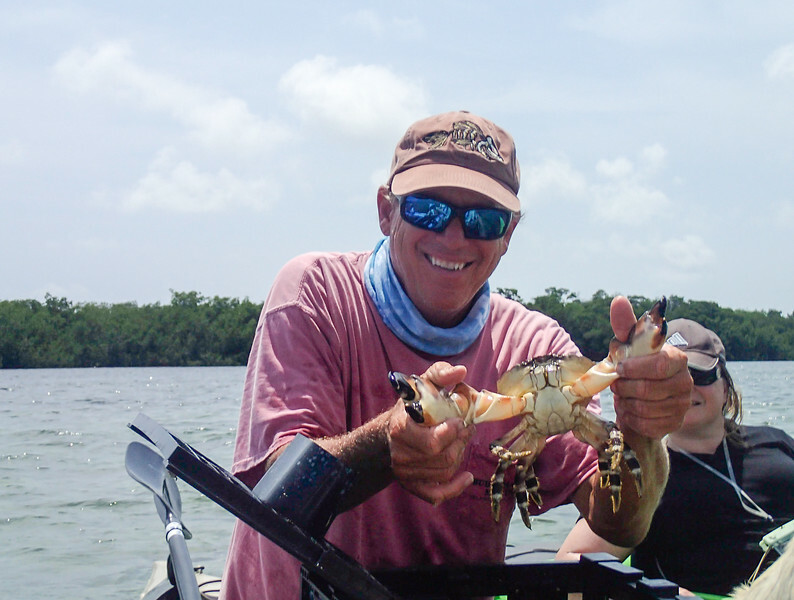 On Big Pine Key, kayaking expert and author, Bill Keogh, owner of Big Pine Kayak Adventures, leads 3-hour tours to give beginners like me a taste of kayaking in the Florida Keys. Of course Bill also leads advanced adventures for expert kayakers, too. Our group of travel writers meets Bill at Old Wooden Bridge Fishing Camp on Big Pine Key. After signing waivers and brief instructions, Bill settles us into kayaks—I’m going tandem with Nancy Mueller of WanderBoomer—that way we can take turns photographing while kayaking Big Pine Key. 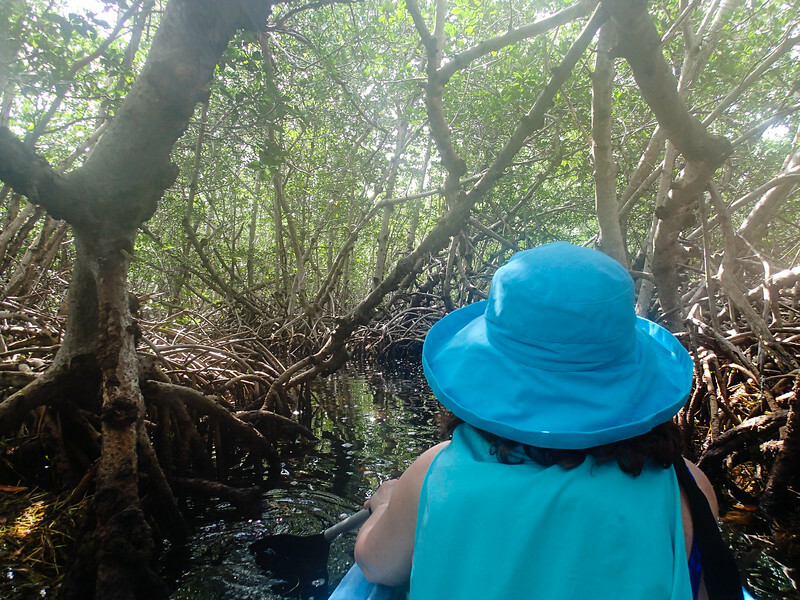 Nancy and I start our journey through the mangrove thickets of No Name Key. A line of kayaks follows Bill across open water for the 15 minute journey to No Name Key. The paddling is easy on a sunny, but slightly breezy day. At the edge of the key, Nancy and I each place a paddle in the kayak and shorten the remaining one before entering a watery passageway through a tunnel of trees. Mangroves clog the narrow waterway, looking closely I see a tiny crab inching its way up one of the many mangrove roots sticking out of the water. Paddles, even though we’ve shortened them, are almost useless in the thick, spooky maze. It’s easier to propel the kayak forward by grabbing overhead branches, that is, when we’re not ducking to avoid hitting our heads. 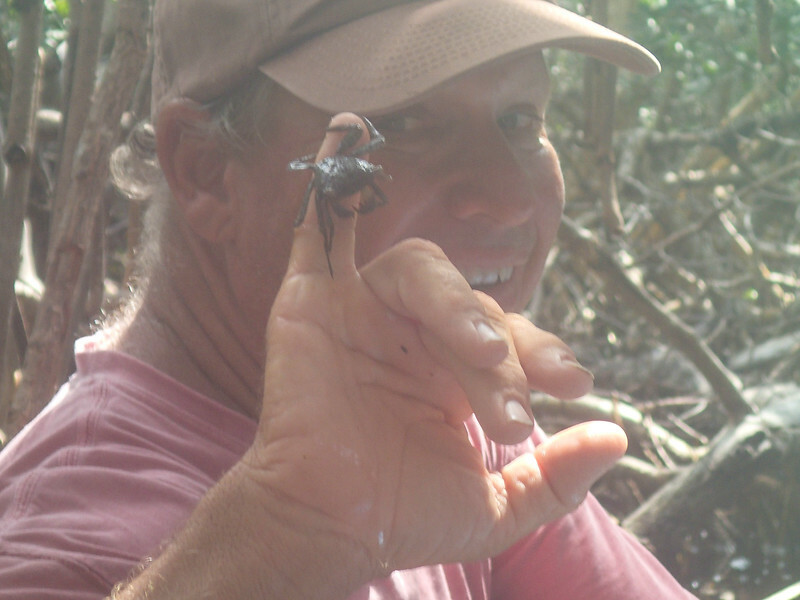 Through my foggy camera lens, Bill Keogh introduces us to a No Name Key resident. Nancy and I lag behind, listening to birds twitter and the splash of unseen creatures slipping into the water. Bill hovers near the back of the group to keep an eye on us and to offer a push when we become stuck in a tricky turn. 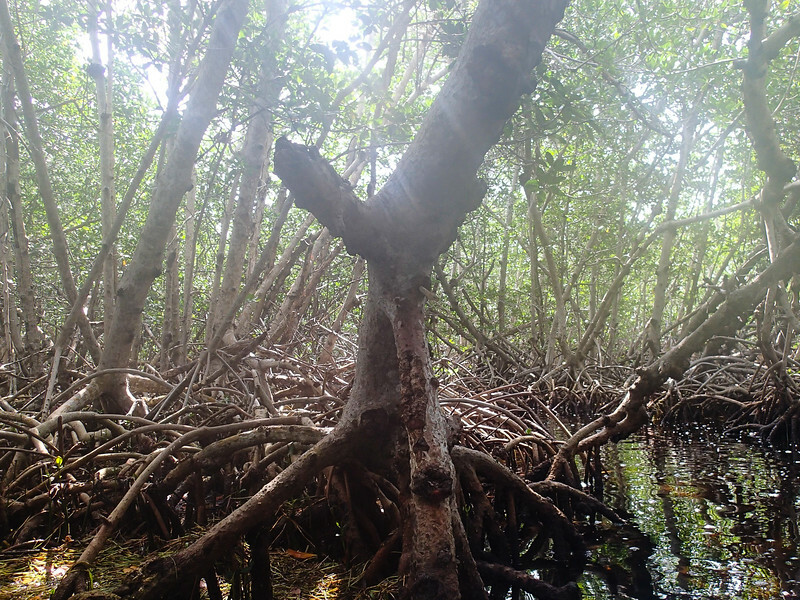 A tunnel of mangroves leads to a lake filled with birds and fish on No Name Key. The passageway weaves through the mangroves before coming out onto a lake that’s a birder’s paradise. We paddle about enjoying the fresh air before heading back on the same hot, steamy path through the mangroves. Wear water shoes, insect repellant and sunscreen for this adventure. As we leave the mangrove tunnels in No Name Key, Nancy and I stop to lengthen paddles and pick up the extra one that’s been riding in the bottom of the kayak. Crab for dinner? Bill Keogh checks the crab traps. Bill leads us to a crab trap to see if dinner is waiting. Since the wind has picked up, he guides us close to the key before picking just the right spot to cross back to Big Pine Key and Old Wooden Bridge Fishing Camp. Exiting the kayak, Nancy and I marvel at the intricacies of No Name Key’s environment and congratulate ourselves for not falling into the water. Planning a trip to the Florida Keys? Check out our Florida Keys Road Trip articles. 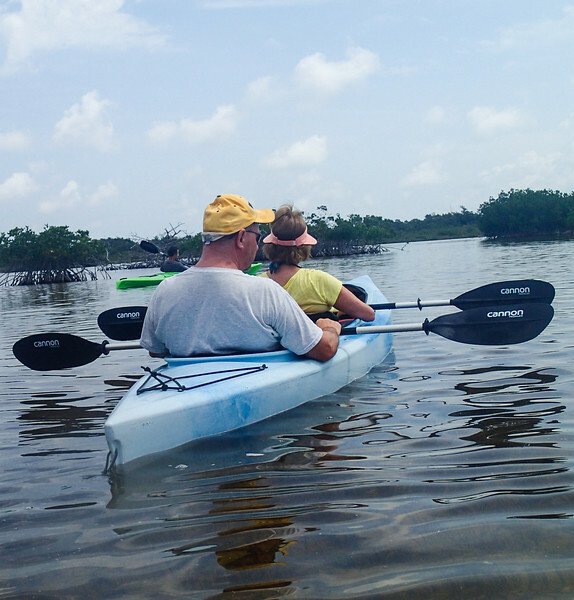 Kayaking Big Pine Key, have you done it? Join the conversation at the My Itchy Travel Feet page on Facebook or send us an email to ask a question or share your experience. Disclosure: This travel experience is provided by The Florida Keys & Key West. But, as always, the opinions are my own.